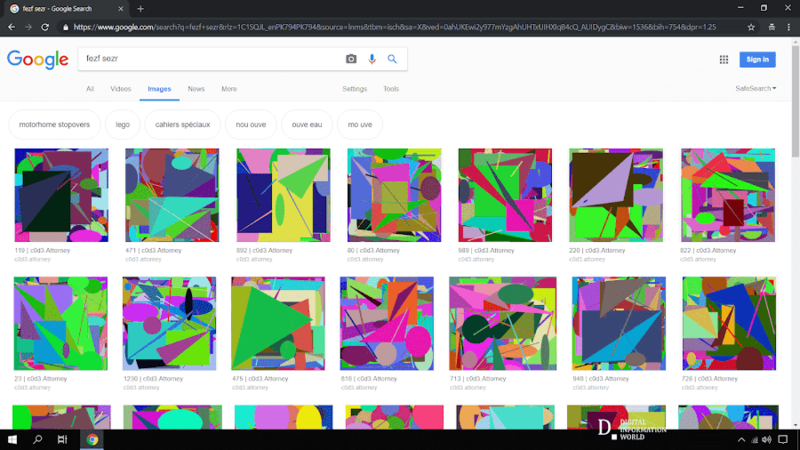 One of the most intriguing things that has been going around on the internet recently has to do with the fact that if you type in two sets of four completely random letters on Google Images such as “fezf sezr” or “lqpx trcd”, you are going to end up seeing a series of strange, angular and oddly modern looking pieces of art. The internet can be a highly inexplicable place at times and this is mostly because of the fact that it has taken on a life of its own and become the sort of thing that people often struggle to fully understand on a day to day basis. People first realized that such a bizarre thing was happening when it hit Reddit, and it was a group of Redditors that were actually able to give a theory on why this might be happening. After all, the fact that two random sequences of four letters each could give search results like these is a highly strange occurrence all in all and even if it doesn’t impact your life on a day to day basis it is natural to be curious about it and try to understand why such a thing might be happening. Basically there are a couple of scripts on a site known as c0d3.attorney that generate these images, and the hash functions of these images have random strings of letters in them. However, getting an answer to this question has ended up raising a great deal more mysteries such as what the purpose of this site actually is which is currently unknown. Google has stated that it is not associated with the site in any way, so unless the owners of the site come forward themselves we might never know why this site exists in the first place.